Should I buy FontExplorer X Pro 3.0? With FontExplorer X Pro 3.0, Linotype significantly improved an already stellar font management utility. Its set migration capability makes it much easier to switch from competing programs, and there are an abundance of new features to justify an upgrade. 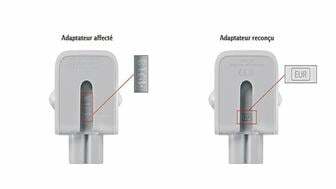 Its feature set is still far beyond its competitors, yet it remains approachable even for casual users. I recommend it to anyone with more than a casual interest in managing their fonts. 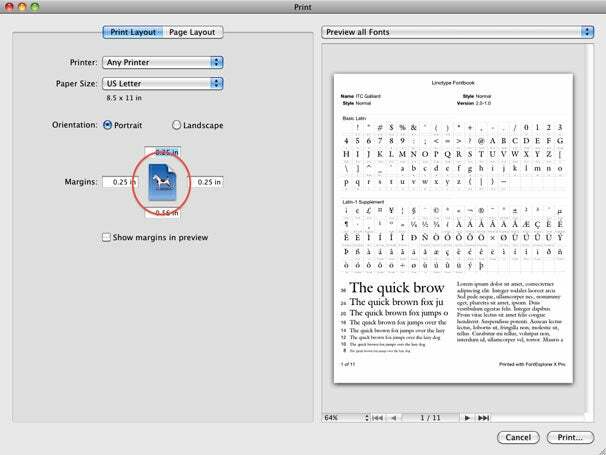 FontExplorer X Pro has long been a fine font manager for graphic designers and publishing pros. Despite its professional target market, the program is easy to use and thoroughly customizable. FontExplorer X Pro 3, a recent upgrade, provides additional improvements over the previous version—if that's possible—while maintaining the same intuitive, iTunes-like interface that made version 2 a superlative font manager. Version 2 was already chock full of features, such as drag and drop addition of fonts; creation of both general sets and application-specific sets; auto activation; the ability to purchase fonts needed for specific documents; backup and cache cleaning; font technical data; server-side management; and more. 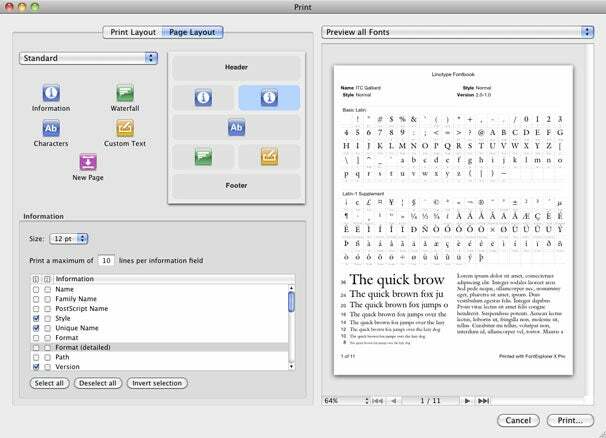 Updates to version 2 facilitated the direct printing of type specimen (sample) pages while keeping the program simple enough for beginners. The excellent sample pages feature offers the five most-commonly used specimen page layouts, but also lets you design your own. This is the Standard specimen layout. There are four others, and each area can be customized. This is one of the best implementations of font specimen printing I've encountered, and for some users, it alone would be valuable enough to justify buying the program. Plus, as an extra-added bonus, FontExplorer X Pro 3.0 employs an updated version of the venerable Mac OS Dogcow, the original page orientation icon used in the old page setup dialog box. The print dialog features a new Dogcow. Moof! 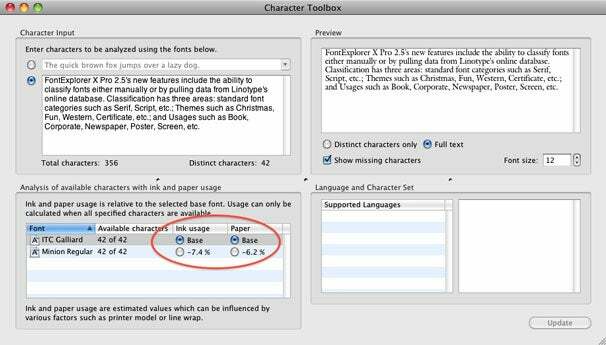 The Character Toolbox is also useful for publishing long documents because it can compare ink and paper usage for various fonts. When designing a book or other long document, it's common to set a portion of it in each font you're considering, to determine its effect on the document length. The Character Toolbox shows you how each selected font compares with your chosen base font for the project: in the example below, we see that a long document set in Minion Regular will require approximately 6.2 percent fewer pages than the same document set in ITC Galliard. The new Character Toolbox finds missing glyphs, indicates available languages, and can estimate ink and paper usage for any font. 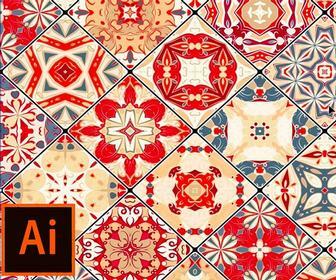 Another Character Toolbox feature—ink usage—is valuable to corporate identity designers. Large corporations print untold reams of paper every day. Saving a few percentage points of ink or toner can have a huge impact on the total cost of printing. In the example above, we see that using Minion Regular for corporate communications will require approximately 7.4 percent less ink or toner than using ITC Galliard. Nice! Version 3 also builds on the program's previous Preview feature: you can now watch a slide show to flip through multiple fonts, and drag a sample over any area of your display—using your own text in any color, size, leading, tracking, and so forth. This is incredibly handy for exploring headline options on a document you have open in any program. It will even show the slideshow as a transparent overlay on your documents. Version 2 allowed you to define "smart" sets that would automatically add any fonts that met your specific requirements, such as font format, manufacturer, classification, designer, number of activations, embedding rights, label, rating, and so on. Version 3 now lets you organize your smart sets into folders. Version 3 has new auto-activation plug-ins for QuarkXPress 9, InDesign CS5, Illustrator CS5, and Photoshop CS5, and the Plug-In Manager now has a "Check for Plug-In Updates" button. This allows Linotype to release updated plug-ins without requiring an update of the entire program. Previously, if fonts resided on a server, the auto-activation plug-ins couldn't activate them. In version 3 they can. Administrators can now export font sets, with improved security settings. And, FontExplorer X Pro can now identify and activate fonts used in placed graphics, which is amazing. Version 3 can clean the font caches for all recent versions of its auto activation applications, as well as for the system. This is incredibly useful for designers who use multiple versions of a font—otherwise, applications may remember a previous version when you're actually using a newer one. FontExplorer X Pro now has keyboard shortcuts for enabling and disabling the most commonly accessed features in the Preview window: kerning, tracking, and ligatures.